The fructosamine test is similar to the hemoglobin A1c test, but it is not as commonly used. The main difference between the two tests is that the fructosamine test measures your average blood glucose level over the past two or three weeks, while the A1c test is a measurement average of your blood sugar over the past two to three months. In addition, the fructosamine test measures glycated protein in the blood instead of glycated hemoglobin. Sugar molecules that are present in your blood stick to proteins. These proteins circulate in your bloodstream for 14 to 21 days, so measuring them provides a picture of the amount of sugar in your blood for that time period. Typically, the fructosamine test is used when your doctor wants to keep a closer eye on your blood sugar levels, such as when changes are made in your treatment plan. The test may also be used during pregnancy when your body is changing constantly. 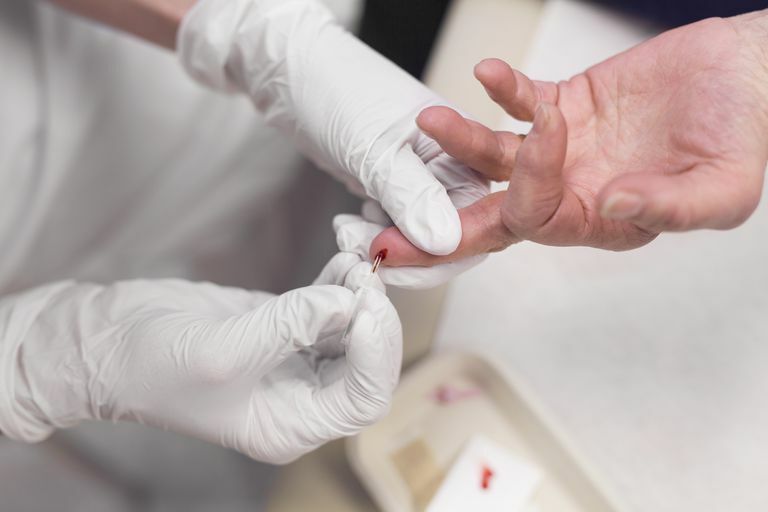 Unlike the A1c test, the fructosamine is not used as a screening test for people who do not have diabetes or who have well-controlled diabetes. Instead, the fructosamine test is used when the A1c test cannot provide reliable monitoring. For example, if you have had blood loss or hemolytic anemia, the rapid turnover of your blood cells will mean that testing the hemoglobin A1c will be falsely low, so a fructosamine will be more accurate. Also, if you have sickle cell anemia or other hemoglobin variants, the hemoglobin A1c test is less reliable and the fructosamine test may be preferred. The fructosamine test is also used when you want more information. It is used as an addition to blood glucose logging when you've had a recent change in your medicines or insulin and can help to monitor the effectiveness of the new treatments after just a few weeks rather than waiting months to do an A1c test. The test is also used in gestational diabetes because changes can happen very quickly during pregnancy. The shorter time span of the test allows the doctor to track your blood glucose levels more closely. This is a blood test done with a sample drawn from a vein or fingerstick and analyzed in a laboratory. Fasting is not required. A home test was formerly produced but discontinued in 2002 as it wasn't accurate. The higher the fructosamine level, the higher your average blood glucose level was in the previous two to three weeks. Usually, a trend is monitored with repeat tests. If the results remain high, it shows you have not had good blood glucose control. Your doctor will try to determine the cause and help you adjust your medications, diet, and other factors to maintain better control. In addition, high levels of ascorbic acid (vitamin C) can interfere with the reliability of the test. Therefore, patients should abstain from ascorbic acid supplements for a minimum of 24 hours prior to sample collection. Fructosamine - The Test. October 30, 2015. Lab Tests Online, American Association for Clinical Chemistry. Johns Hopkins Diabetes Guide. Alternative markers of glycemia: fructosamine, glycated albumin, 1,5-AG.